One of the attractions of my new shop was the possibility to see a biotech company built from the ground up. Each of my previous companies had been a long-standing concern by the time I got there; even Codon Devices had a year plus under its belt and some equipment already mothballed. The new venture moved into its first lab space last week, and as you can see from the picture all we have at the moment there are bare walls. So each of us has been pondering what equipment and supplies we need for a number of weeks now. It's not easy remembering every little item that is in a lab, nearly invisible but absolutely critical when you need it. Constant checking and cross-checking of the lists has identified complete duplications, which is a good thing (better to duplicate than omit) as well as many near duplicates. Omissions are of course harder to catch, especially remembering components sold separately (chromatography rigs need columns!). These are more complicated, as one must figure out whether two similar items should really be merged, and sometimes there are significant personal preferences for one brand or style over another. So far, all has been resolved amicably; we haven't yet had any scientists measure out ten paces, turn and fire pipette tips at each other! We also made a trip last week to one of the several Boston-area vendors of used lab equipment. Just off of the outer ring highway of Boston (I-495) and nearly an hour from the city, a low slung warehouse which looks deceptively small sits across the road from the Merrimack River. Inside, I was quite struck by the free reign they allowed us. It's not like a dishonest soul could walk off with much; other than pipettors most items are too heavy or bulky, but rather you'd think the insurance company would get nervous. Various nooks and cubbys contained mostly organized equipment. Beakers of pipettors greet but then you encounter a science geek's heaven: shelves of scales, centrifuges lined up all over the floor, chemical hoods and incubators and lab fridges and whatnot. Smaller rooms and lofts have the littler stuff; microfuges and glassware and other benchtop items. The general plan is anything you order is then cleaned, reconditioned and shipped out. Walking through was a good reminder of some of the less prominent yet critical gear: I would have never remembered a deionizer. Even so, many items still were overlooked. I've carved out one small area as what I'm in charge of outfitting, and only after the visit did I think of a key item (which luckily, we found in their on-line catalog). Some equipment, though, will never leave that warehouse, at least not intact. In each area it was not uncommon to see items tagged as either of dubious viability or simply "parts only". Many of the brands on equipment are long gone; one of the thermocyclers I saw was from "Perkin Elmer Cetus", which later was swept into ABI (and should not be confused with the current Perkin Elmer, which is making a play in the equipment arena). Some equipment is probably just out-of-favor and staying that way; I saw a beautiful piece of glassware crammed with what must be several pounds of liquid mercury (our chemist identified it as a very precise pressure monitor). Alas, most of what gets my juices flowing wasn't there. A few thermocyclers were about it. DNA sequencers and synthesizers tend to be a speciality item handled by a few specialized vendors. Not that this makes them necessarily expert on the subject; on a lark I inquired about an Illumina GAII (not IIx!) one was offering and the pricing quoted was eye popping -- for a similar price I could probably get a new GAIIx or a fleet of MiSeqs. 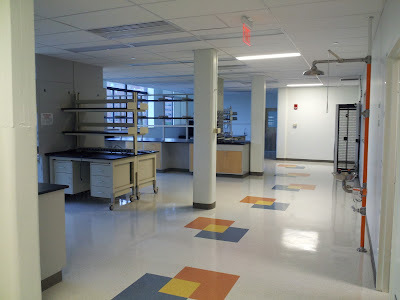 Equipment and supplies should start rolling in next week, so the lab will go from spacious to packed in no time at all. The warehouse place is also a reminder of how things can go the other way. While some of the equipment no doubt was declared surplus to make room for newer equipment, others retained suggestions of how they came to the market. Some of the glassware still had recipes written in sharpie, and a few even had aluminum foil dust caps. And who would surplus away a favorite pipettor or balance? Probably most of these items arrived after major layoffs or companies going completely belly-up; I wouldn't be surprised if some old Codon equipment lurked there. A reminder also that we can't be a kid in a candy store; buy only what you need and pay no more for it than you need, or it will end up waiting for a buyer on the banks of the Merrimack. With the crunch hitting Illumina I am sure they would let a GAIIx go pretty cheap if you guarantee to use it. Have you discussed reagent rental? I've been having a grand old time designing and 3D-printing laboratory basics, like tube stands, column holders, magnetic traps, vacuum manifolds and pipetter stands. Yesterday, I designed and printed a multiplexed wet cell for one of UCD's atomic force microscopes. I'm pretty sure such a thing did not exist before, and it only took about twenty minutes working in OpenSCAD and maybe a $0.03 worth of plastic. Once I've got them tweaked and tested, I'm going to upload the models I've created under a GPL license. If enough people did that, outfitting a new lab would be a pretty different experience. I think you can work out a similar concept (reagent rental) with Ion Torrent by purchasing their Torrent server as well .. FYI only .. not affliated with them .. Good luck!